First Minister Alex Salmond has today referred himself to the independent advisers to the ministerial code after claims made in various newspapers by Paul Martin MSP regarding SNP donors and official engagements at Bute House. Mr Salmond has written to Mr Martin outlining that he will make the referral after the Labour MSP blundered the process by which a complaint should be made. I write following press reports that you have written to Dame Elish Angiolini making complaints under the Ministerial Code. I am sure that you are aware that as First Minister I established for the first time an independent panel to investigate alleged breaches of the Ministerial Code to provide a robust and transparent process. The procedure for making such a complaint is made clear in paragraph 1.6 of the Ministerial Code. Any complaint should be directed in the first instance to me as First Minister so that I may consider whether the matter should be referred to the independent advisers. Hopefully you will manage to get this simple procedure right on any future occasion. Despite not having received such a letter of complaint from you, I have decided to refer the issues reported in the media about visitors to Bute House in the Daily Telegraph on 28 March, the Daily Mail on 31 March and again in the Daily Telegraph today. I would not wish your misunderstanding of procedure to prevent an independent evaluation of the merits of the points you have been so keen to publish. I have therefore written to Dame Elish Angiolini, as one of the independent advisers, and asked her formally to investigate whether a breach of the Ministerial Code has occurred. Dame Angiolini has been provided with copies of the three press reports and, of course, will have received your letter. f you have anything further to provide a basis for your complaints then let me know so that this material can also be provided. The rest of the procedure is now in the hands of Dame Angiolini. The findings of the independent adviser will be published. I will accept them and I hope that you will now indicate that you will so the same. It is unfortunate that you have chosen not to follow the procedures set down to investigate allegations such as these. I am confident that, as on each of the three previous occasions your party has made complaints of this nature, the independent advisers will find your allegations to be entirely without any foundation. “The First Minister has taken the decision to refer this issue because we have total confidence in our position, in light of this entirely spurious and absurd complaint from Labour. “All complaints previously considered by the independent advisers since 2007 were dismissed and we will similarly accept the results of Elish Angiloini’s findings in this case - we ask that Paul Martin does the same. “No private dining for donors takes place at Bute House, never has under this administration, and never will. Labour, the party of cash for honours and the Ecclestone affair, are guilty of the most appalling hypocrisy. “Government functions are all in the public domain because, unlike the last Labour-led administration, we publish details of everyone receiving Bute House hospitality at a reception, lunch or dinner. No-one has ever suggested prior to this that individuals should be excluded from Government events simply because they are donors. This is a totally ridiculous proposition. “By long-standing practice for many years, First Ministers and before that Scottish Secretaries have nominated personal guests for the Royal Garden Party in Edinburgh, and since 1999 for the Opening of the Scottish Parliament, and offered such hospitality. It is insulting to suggest any upstanding person should be excluded. If SNP supporters were to be excluded, by definition that would cover half the population. The list below shows the First Minister has been wholly exonerated in terms of all previous complaints made of him. First Minister ‘wholly exonerated’ in breach of Ministerial Code’. Mr Sheridan’s allegations were wrong and ‘ill founded’. Orkney and Shetland – the mandate for Scott and McArthur’s claims? Given the extraordinary statements made by the Orkney and Shetland MSPs in recent days about the stance of their respective constituencies if Scotland becomes independent, it seems relevant to look at their mandates in the last election – May 2011. Using 2010 figures, the population of Scotland is 5,222,100, that of Orkney 20,100 and of Shetland 22,400. The combined populations, 42,500, represent 0.81% of the Scottish population. Their 7,374 votes represents 17.4% of the total population of Orkney and Shetland, and represents 0.14% of the population of Scotland. Between them, Scott and McArthur received 10,644 votes in the 2007 Scottish Parliamentary elections but only 7,374 votes in 2011, a loss 3,270 votes, equalling 30.7% of their support. Anyone can play games with election statistics in a democracy, especially when the lamentably low turnouts in British elections are taken into account. The bottom line is that both were re-elected and now represent their respective constituencies in the Scottish Parliament. But given the lamentable performance of the LibDems overall in the Scottish election of 2011 and the present record of the LibDems in Coalition Government, the major decline in support for both Scott and McArthur in their own constituencies and the above statistical analysis, it seems to me an act of folly and arrogance to make such radical claims and threats as those they have made this week on behalf of the people of Orkney and Shetland. Purely on the basis of a narrow mandate they secured last May - without as far as we know any wide ranging consultation with the total electorate - they have effectively threatened to opt out of Scotland, a nation they have been party of since the 15th century, at a crucial moment in its history. The SNP and the Scottish Government, bluntly, have been less than impressive in their responses to this, and yesterday's statement SNP admits Shetland and Orkney could opt out of independent Scotland and Liam McArthur - Angus MacNeill authorised or not, astonished a number of people, including me. I hope a wider and more representative range of voices from the people of Orkney and Shetland may be heard soon. Michael Moore, Colonial Governor and representative of nothing but a failed and discredited political party, will attack the SNP today. We don’t need to know anything else, because he and his party don’t matter to Scotland or Scots. I thought of saying more, but Ian Bell has said most of it today in the Herald, as have others, including letter writers. I occasionally get correspondents saying that I don’t have enough discussion and comment on my blog, and that this is a factor of my moderation constraints, .i.e. Google or other ID required for comment. No such requirement exists on my YouTube channel, TAofMoridura, and that’s YouTube’s lack of constraint, not mine. So a lively debate rages on some of my YouTube videos, sometimes for months or even years after they have been posted, and believe me, there’s a helluva lot of work involved screening out – by pre-moderation - the incoherent, incomprehensible, obscene, obsessive, libellous, repetitive, irrelevant and sometimes just plain vicious comments that come in my inbox each day. I can of course, block all comment, but it is something I’m reluctant to do because there’s so much good stuff. A﻿ parcel of rogues in a nation. Does anyone in Scotland still vote for the Lib Dems? Thumbs up for Scottish independence. Michael﻿ Moore is better known as The Secretary of State AGAINST Scotland, he just stands by while his Tory Hatchett man colleague Danny Alexander lays into Scotland. SNP, SDA, Solidarity, SSP and Scottish Greens are all working to free us from the shackles of this union, good on them. Inertia in people is much the same as inertia in objects, as the body in motion will tend to stay in motion, the old thought process and habits will continue without a good reason, or a “safe” way to﻿ ensure change. The SNP argument is that it’s just a natural step to take. The Unionists argue it’s a chasm. The conservative voter, for the most﻿ part, will not step. That is a fundamental definition of conservatism. The Union argument is more fear and scare tactics, these will often work with the more conservative voter. Support on union is based on negativity simply because there's not much positives for Scotland to stay in the union from a Scottish perspective. Scotland paying it's neighbours to speak on it's behalf while claiming in public that Scotland contributes nothing and is a 'subsidy junkie' nation. Britain is an ailing bankrupt state. Time this rancid Union parasite was removed once and for all from the body of Scotland. Only with this parasite cleansed from Scotland, can﻿ we as a nation succeed. Maddening! Westminsters approach each week, each year, each﻿ decade, is to tell Scotland that we're getting an, unfairly, good deal from the union, that our economy is not strong enough to support ourselves and to promise that London is on the case to make that economy stronger in the future. Within the UK Scotland will never be able or allowed to fulfill it's potential and all the double talk from London won't change that. A Lib Dumb and a Tory as colonial governors for Scotland, could you have any other two figures who are less﻿ representative of the Scottish people? RBS Successful = British. RBS Unsuccessful = Scottish. Bailing out a bank with more﻿ English employees than Scottish was a wise move for the UK. Making themselves sound so generous to Scotland for doing it, is simply ludicrous. The choice has to all intents and purposes come down to devolution max or full independence. All the talk of economic factors, of the currency, of borrowing powers, of taxation and of the detail of independence is smoke and mirrors – the last redoubt is defence and foreign policy. Because no country can truly be a nation unless it controls its own foreign policy and defence. No country can be a nation if it lets another nation decide in what cause - and when - to place its servicemen and women in harm’s way, and to sacrifice their lives if necessary. No country can be a nation if it permits another to determine its fate in the most fundamental areas of nationhood. Scotland cannot be a nation again unless it is fully independent. Do all of my fellow Scots men and women agree with me on the above principles? I don’t know the answer to that – I don’t even know if my fellow nationalists agree with them. I don’t know if every member of the Scottish Nationalist Government agrees with them. I must assume that Scots committed to the Union don’t agree with them, or if they do, they only do so for the entity that claims to be a nation – the United Kingdom of Great Britain and Northern Ireland. Only a referendum will determine the answer, and that is why the Scottish electorate must be very clear on the fundamentals – not the detail – of what independence means before they answer a question - or questions - at the referendum ballot. I’ll get the whole Cabinet to make the case for Scotland staying in the UK – Moore. So we have Michael Moore – the Colonial Governor, a member of a party reduced to a pathetic rump in Scotland and wholly discredited in the UK, and a failed and bitter former leader of that party in Scotland, Tavish Scott, spewing their bile and frustration against the choice of the Scottish people and the decisive democratic mandate they gave to a party committed to Scotland’s independence. This from the federalist party, while the two solidly unionist parties desperately proclaim their independence from Westminster, wrapping themselves hastily in an ersatz kilt. And the Blair/Libya story appears, fairly presented by David Maddox, while the unionist spinners are doubtless trying to revive the tired lie that somehow the Megrahi release was a result of connivance between Blair, Alex Salmond and Kenny MacAskill, a fiction so bizarre that it beats Fonzie jumping the shark. A few days ago the Institute for Public Policy Research tried - in a letter to the Scotsman by Tony Dolphin - to correct the distortions that the Scotsman had placed on their report on the public sector in Scotland. The IPPR denied that report had described the Scottish public sector as bloated, that it relied on out-of-date figures and was an attack on the SNP’s proposals for lower corporation tax. Needless to say, in the best traditions of Hearst-style yellow journalism, The Scotsman (was ever a paper so misnamed?) did not give the prominence to these denials that it did to its original anti-SNP coverage. Gaun yersel, Lesley … that’s journalism! That’s comment! O schadenfreude–can I resist you? 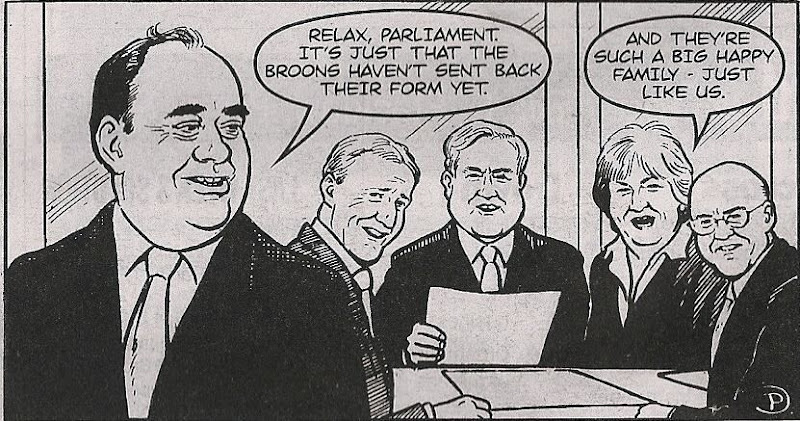 Alex Salmond has been magnanimous and generous in victory to the three other party leaders following their resignations. Tavish Scott is a pathetic spectacle these days, reflecting all the pressures that are destroying his boss Nick Clegg’s credibility and morale, but with the certain knowledge that he and his Scottish ‘party’ will face the wrath of the electorate just over three week, while the architect of his misfortunes and his fellow jerry builders may be able to defer the consequences of their folly for year or so. Tavish and the Scottish LibDems quite simply are expendable in the Cleggite game plan, and Danny Alexander and Michael Moore, having tasted the heady delights of the illusion of power, are focused firmly on their Westminster fortunes, and the next general election. Poor Tavish, a nice guy in the LibDem feeble and ineffectual LibDem mould of niceness, knows this all too well, and could be forgiven for looking enviously at his predecessor Nicol Stephen, now Baron Stephen of Lower Deeside in the City of Aberdeen, sitting comfortably in the Lords. Retreat to the farm must be a seductive prospect for Tavish the Panicking. But he puts a brave, if logically incoherent face on things, because what he ‘hears on the doorstep’ – the politician’s last defence when all around him is crumbling – is different from what the polls say, from what the media says, from what the pundits say. I don’t doubt it – faced with this shy boyish grin and self-deprecating style, exuding vulnerability and lack of confidence, it would take a heart of stone not to try to say something reassuring lest he burst into tears. And last night’s Twitter comments towards the end and just after the interview tended to the Poor Tavish, nasty Gordon Brewer type, including from those who did not share his politics. I have a heart of stone (in political, if not in cardiac terms) when it comes to ineffectual politicians. I don’t want nice guys crying in their beers – I want robust, decisive, analytical politicians with sound values, pragmatism and a belief in Scots and Scotland. Go back to the farm gracefully, Tavish, and live happily ever after – the political kitchen has got too hot for you, and you just can’t stand the heat. Otherwise, you may find that the American phrase he bought the farm, meaning a sudden end, may acquire a certain resonance. And my thanks to Gordon Brewer for this political dissection. It is the job of political interviewers to reveal the inconsistencies, evasions, factual inaccuracies and policy contradictions in politicians, a job that democratic accountability demands they do well. Like all dissections, it is not always a pretty sight, but nonetheless vital to a healthy democracy and a free press. Last night Gordon Brewer did it clinically and professionally, without giving way to either disgust or pity. Isabel Fraser quizzes the Holyrood opposition leaders on why they blocked the SNP's attempt to introduce minimum pricing for alcohol, a measure supported by medical experts, nurses, the police, alcohol harm reduction agencies, etc. Iain Gray trots out his ridiculous argument that the measure would have been illegal, only to have it gently pointed out to him by Alex Salmond that the government is prohibited by law from introducing a bill for legislation that would be illegal, and that the law authorities in Scotland has certified that the bill was legal. Iain Gray clearly does not understand the contradictions inherent in his policy on knife crime - after all, he is advised by Andy Kerr, who gave a train-wreck interview to Gordon Brewer on this recently. But Annabel Goldie is a lawyer - she must know the implications of what she is proposing, yet she peddles this backwoods Tory nonsense for expedient electoral gain. Tavish Scott at least emerges from this with some credit. If you are a public sector worker in Scotland - listen carefully, and decide where your vote should be cast on May 5th. Only the SNP unequivocally supports the public sector and respect its vital role in Scottish society and the commitment of its workers. If you are a public sector union member in Scotland, ask yourself why your union leaders slavishly support the party that is committed to attacking your jobs - or "reducing bureaucracy", as Iain Gray prefers to call it. If you are a public sector full-time officer, try to forget your career aspirations and the high road to England for long enough to serve the interests of your members, instead of supporting the Scottish Labour Party. If you are a public sector Tory, God help you - the Tories are the sworn enemies of the public sector, except when it provides cosy sinecures for their favoured few. Remember which coalition parties are trying to destroy the NHS. Vote SNP on May 5th!